Jordanian Salafi cleric makes surprising ruling, notes Jewish presence pre-Islam and says 'Israelites' should thus be given a right to pray. A Jordanian Muslim preacher has called for Jews to be allowed to pray on the Temple Mount, and even for a special "house of prayer" to be set up for them there. 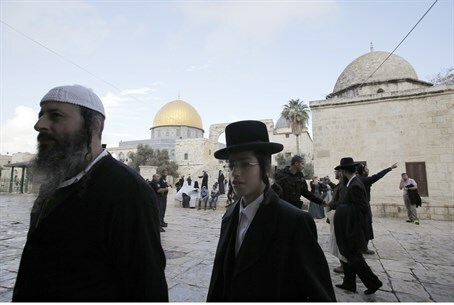 Despite its status as the holiest site in Judaism, Jews are banned from praying on the Temple Mount (as are other non-Muslims) due to pressure and threats from Muslim groups - not least among them the Waqf Islamic trust, which administers the site under Jordanian auspices as per Jordan's peace treaty with Israel. Jewish activists have been campaigning to change that, branding such measures illegal and discriminatory - and have faced hostility and even violence, sometimes deadly, by Muslim extremists in response. "I have given a lot of thought into what I am about to say, because I know that it is the most important issue of our times, and that whoever talks about it is likely to face severe criticism, and will be accused of generating controversy and maybe even strife," Al-Ajlouni begins, wary of the Islamist backlash his statements would likely trigger. Having established its historic and religious importance to Jews - and the fact that al-Khattab allowed them to continue worshipping there himself - he states that today as well "There should be a special place of worship for the Jews among the Israelites under Hashemite and Palestinian sovereignty, and in agreement with the Israeli regime." He emphasizes, however, that the site should remain "under Hashemite [Jordanian] sovereignty and control." "This by no means entails the harming of the Al Aqsa Mosque or the Dome of the Rock," he added, clarifying that under his vision "part of the courtyard, where there are trees, will be allocated for the prayer of the Israelites." He further called on Jordanian and Palestinian Islamic scholars to issue a fatwa (religious ruling) to "clarify their religious position regarding the building of a place of worship dedicated for the Israelite Jews." Although many Jews will view the notion of maintaining their holiest site under Muslim rule as problematic, Al-Ajlouni's very acknowledgement that the Temple Mount was used as a place of worship by Jews is significant in itself. Up until the 20th century Islamic literature consistently referred to the Mount as the site of the Jewish Temple of Solomon, but Arab and Muslim opposition to the growing Zionist movement sparked a wave of revisionism which saw nearly all reference to the site's Jewish heritage removed from their history books. Today, the Waqf and Palestinian Authority deny that the Temple Mount was ever Jewish, and actively seek to erase any traces of its Jewish past by destroying precious artifacts. One detail Al-Ajlouni did not mention about Al-Khattab's visit to the Temple Mount was that he was brought there and encouraged to build the Dome of the Rock by his adviser Ka'ab al-Ahbar, a Jewish rabbi who converted to Islam. According to some theories, the shrine was in fact intended as a place of worship for Jews, while the separate Al Aqsa Mosque was to serve as a Muslim place of worship. Indeed, as one prominent religious-Zionist scholar noted in a recent interview with Arutz Sheva, Jewish activists have no interest whatsoever in the mosque - despite regular claims by Islamists that they intend to "storm" it. "They say we want Al-Aqsa (Mosque). Who wants Al-Aqsa? It's outside of the Temple Mount. It's very possible that it will remain even when the Temple is rebuilt!" said Ramat Gan's Chief Rabbi Ya'akov Ariel, noting that the mosque itself stands outside of the sanctified areas of the Temple Mount according to Jewish tradition, though it is part of the wider complex. "But because of their forcefulness they are convinced we too want to come to Al-Aqsa by force," he said.